If you are planning a Cinco de Mayo feast, you are going to need a satisfying side dish to accompany your meal. A Savory Mexican Cornbread is the perfect canvas for sopping up the sauce. And for those of you who can’t have your food touching (you know who you are) it’s okay to keep it on a separate plate. This cornbread does not have a dense, hockey puck-like consistency. Instead it is cakey and very moist. Void of any overwhelming flavor, it makes the perfect sidekick for an already flavorful meal. It melds nicely. I know lots of people stick with their Jiffy cornbread from a box but this has such a better consistency and does not take much effort to put together. If you are like me and enjoy your cornbread sweet, butter and honey are a stunning addition to each slice. You must try it. Here’s what you will need: Shredded sharp Cheddar cheese, buttermilk, vegetable oil, eggs, cream-style corn, chopped green chiles, cornmeal, all-purpose flour, baking powder, baking soda and salt. Optional garnishes include: Jalapenos, cilantro, honey and butter. In a large bowl mix 1-1/2 cups shredded sharp Cheddar cheese, 3/4 cup buttermilk, 1/3 cup vegetable oil, 2 eggs, 1 can (8.5 oz) cream-style corn and 1 can (4 oz) chopped green chiles. In another bowl mix 1 cup cornmeal, 1 cup all-purpose flour, 1 teaspoon baking powder, 1/2 teaspoon baking soda and 1/2 teaspoon salt. 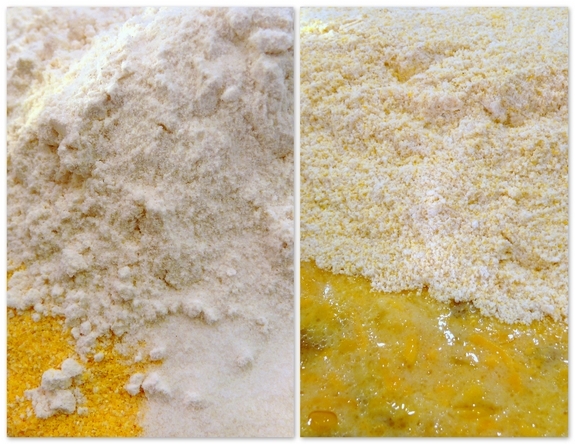 Add to cheese mixture; stir just until dry ingredients are moistened. Generously spray a 1-1/2 quart casserole dish with cooking spray. Pour mixture into casserole. I garnished the top with some jalapenos and cilantro but it’s totally optional. Bake 40 to 50 minutes in a 375 degree oven or until cornbread is a deep golden brown and toothpick inserted in center comes out clean. Cooking times are going to vary based on width and height of the pan you use. My dish was 10″ in diameter and 1-3/4″ deep. My cooking time was 41 minutes. I covered mine with butter and honey. It was so good. Beautiful colour…just look at it. Yes the jalapenos & fresh cilantro on top add to the appeal…very very nice! My mouth is watering soo much! That looks delicious and so simple to put together.The honey and butter just put it right over the top..
That looks so good! Too bad Ben will only eat Jiffy! OK, that looks crazy good! Is it wrong of me to wish my children grown so I can start indulging in less boring cooking and baking? I’m not going to wait. I’m diving into this one. This must be the best, moistest cornbread I have ever seen. And smothering slices in butter in honey is absolutely WOW! Wow that looks like the best cornbread ever. jalapeno? honey? I’ll have to give it a try. I LOVE me some cornbread! Could those pictures show more yellow/orange goodness (enhanced with a few more colors)? I don’t think so. And, you had yours with honey. Yum. Spread the honey love … as beekeepers that makes us very happy. This is another easy recipe for me to convert to gfe, Cathy. You remain one of the best recipe sources ever–thank you! That is beautiful and looks so moist. I love cornbread, my husband doesn’t, but he LOVES jalapenos, so maybe that’s the key! Yum, the upside to the downside economy is that the old fashion tried and true foods are in “fashion” again. Yeah for that, I love cornbread. Love savory cornbread.That looks so moist too. That looks insanely good. We won’t need a holiday to enjoy it around here. I think it’s possible that I just gained 10lbs reading this. I could quite easily eat that entire pan of Mexican cornbread. Ya know Cathy, you’re taking all the work out of my Cinco de Mayo menu planning! Thanks! Wow, the honey and butter with the savory sound delicious. I love a moister cornbread and this looks perfect to try out. I love corn bread. I don’t really care for the Jiffy but like the marie callendars. I’ll have to try it from scratch! Yum yum… and I love it drizzle with butter and honey. Perfect! I was thinking Cinco today too w/ some Margarita Cupcakes! Let’s party! Who needs Cinco de Mayo to enjoy this? I would eat it any day of the year! This cornbread is quite different – it looks moist whereas I so often find cornbreads chokingly dry. My corn bread turns out terrible. I am so eager to try your recipe. I have had cornbread from Z’Tejas Southwestern Grill when I visited Seattle and I loved their spicy recipe. I always go back there when I cross the border for shopping trips. Now I can try your version at home. Oh man, this looks good. I love corn bread and the jalapenos on top just make it look even yummier. I just wanted to let you know that I made your lemon ginger scalloped sweet potatoes the other night for friends of mine and their toddler, who NEVER eats anything potato, loved them. She’s tried so many potato dishes – sweet, red, idaho, gold – and he just spits them out. But your recipe, he kept demanding more. The corn bread looks fantastic, too. I love your recipes. They are relatively easy to execute, but taste like they took all day. I just knew you’d be tickled to read that story. Looks great I love corn bread, Mexico, and jalapenos, therefore I love Cinco de Mayo. Happy Holiday! I want to make this, I can not believe I never made any corn bread before. Yours look so delicious! I should never read your blog hungry! I want that! I’ve never had cornbread. This is something I would love to try. I will eat anything with jalapenos in it. Seriously. This looks too good to pass up. Nice, my mom used to make something a lot like that. Good times. I grew up eating mexican cornbread…it is one of my very favorites…. you are my idol as far as the blog queen who gets the most comments on every post….you are amazing! Here is a use for some of the cilantro…while enjoying the heat and sweet of the cornbread. I think I would really enjoy this! I love how that looks with the cilantro and jalopeno slices. My mouth is watering as I scrutinize those lovely pictures! What a delicious-looking cornbread! I love jalepenos as well, but I’ve never thought of garnishing the batter with them before sticking it in the oven! Thanks for the great idea! I agree, toss the box of Jiffy!!!!!!! I love jalapenos in cornbread, too. Sometimes I toss in a can of fire-roasted green chiles; sometimes I use slices of fresh peppers, if I have them. Love this recipe and will bookmark. Awesome! Cornbread is such a comfort food for me…It’s a childhood thing. We had cornbread served with quite a few meals. I love your Mexican version. Can’ wait to try it! I’ve yet to try my first cornbread and this looks really hard to resist! Hi Cathy .. looks delicious – I love Cornbread .. we used to have it in South Africa .. it’s not so popular here .. and I haven’t been able to get buttermilk here .. I should try again. 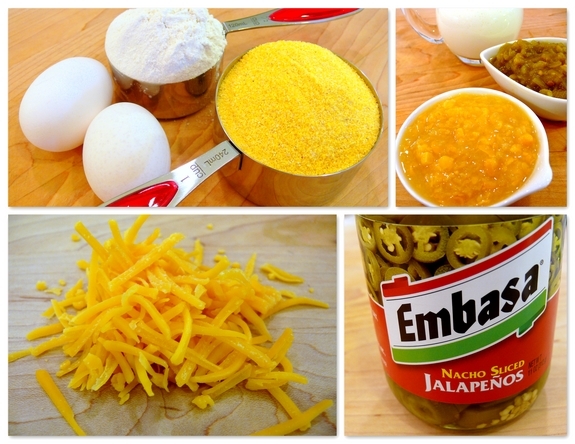 I am making jalapeno cornbread with tortilla soup tonight! One of my fave meals. Thank you for permission to keep mine on a separate plate! I confess to my peculiarities! that shot with the butter and honey? money! that is exactly what I would do: lots of butter and lots of honey baby! Gosh – cornbread is something I never think of making, though I can’t for the life of me think why not. I would just lap that stuff right up, especially with the butter and honey! YUM. Your last 2 Mexican-style dishes have my mouth watering—love them both. 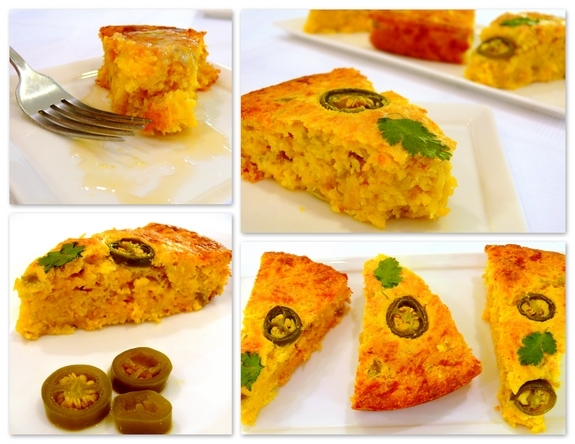 I’ve always wanted to try Jalapeno Cornbread and now you’ve convinced me. Served with ice cold Mexican beer, I’ll be set! I had some zucchini I needed to use up and I love the zucchini and onion saute thing. I saw your recipe and I had a brainstorm. I wanted to share with you your influence! It turned out great, now I have to make your mex version next…. I have never seen a moister cornbread! I’m with you- butter and honey on this! I’m going to have to give this one a try! Oh man that picture with the butter and honey…. oh man. This is so lovely! And as a confessional, may I add that while I do love a nice, sweet jalapeno, those pickeled ones disappear in an instant at home! Made this recipe today for lunch and served with pinto beans and smoked sausage. The cornbread was a delicious compliment to the meal. The cilantro on top was eye pleasing and added a subtle taste. I loved it and so did everyone else!! Thanks, Cathy. Your version of cornbread looks amazing! The jalapenos on top really add appeal! That’s the nicest cornbread I’ve ever seen. Just beautiful! I know what I’m making this weekend! Yum!!! This looks so good! But I have to ask: is it very hot, like spicy hot? My mother is very sensitive to anything spicy so I would appreciate it if you would let me know! Not spicy at all. Make sure you use mild green chiles and leave the jalapenos off the top. This is my absolute favorite cornbread! Oh no!!!!!!! What happened to your blog settings? I no longer see your full blog content in my Google Reader, I just see the first few lines! Yours is my one of my favorite blogs of all times, but I like to see content without having to click! Please tell me it isn’t so…. Oh My Gaw…I love me some jalapenos so I will be making this as soon as possible. Who needs a main dish, I’ll call this dinner! I added Hatch chiles to the recipe! This is the best recipe for cornbread! It’s a keeper. Adding the butter and honey was over the top and so delicious! I’ve got to make this the next time we have chili! Better yet, my Mexican soup!